Nearly fifteen years after her debut collection, My Misspent Youth, captured the ambitions and anxieties of a generation, Meghan Daum returns to the personal essay with The Unspeakable, a powerful collection of ten new works. Where her previous collection explores what it is to be a struggling twenty-something urban dweller with an overdrawn bank account and oversized ambition, The Unspeakable contends with parental death, the decision not to have children, and more-a new set of challenges tackled by a writer at her best, investigated in the same uncompromising voice that made Daum one of the most engaging thinkers writing today. 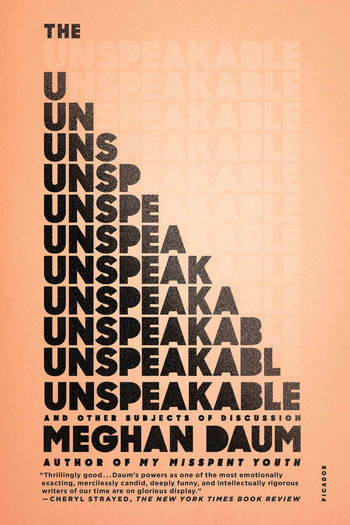 In The Unspeakable, Daum pushes back against the false sentimentality and shrink-wrapped platitudes that surround so much of the contemporary American experience. But Daum also operates in a comic register. With perfect precision, she reveals the absurdities of the New Age search for the "Best Possible Experience," champions the merits of cream-of-mushroom-soup casserole, and gleefully recounts a quintessential "only-in-L.A." story of playing charades at a famous person's home. Combining the piercing insight of Joan Didion with humor reminiscent of Nora Ephron's, Daum dissects our culture's most dangerous illusions while retaining her own joy and compassion. Through it all, she dramatizes the search for an authentic self in a world where achieving an identity is never simple and never complete.